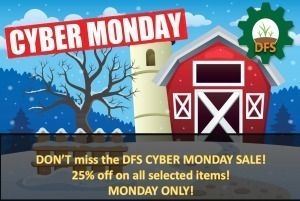 Don’t Miss the DFS CYBER MONDAY SALE! Tons of users’ favorites on sale for 25% off! Favorite items such as still, beehive, lily, tool kits, and more! Monday, November 26, in front of the DFS Mainstore Only! The sale is only for 24 hours on Monday!